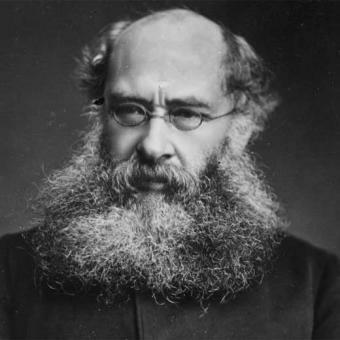 Today in Masonic History Anthony Trollope Passes Away in 1882. Anthony Trollope was an English writer with strong ties with Ireland. Trollope was born in London, England on April 24th, 1815. His youth was fairly troubled. His his father was trained as a barrister although due to his temper he failed the bar. His father also had several failed ventures, which caused the family financial hardships. Anthony attended the Harrow School as a day pupil so he could attend for free, his father had actually started a farm nearby so that he could attend according to the law of the time. Anthony was tortured at the school and was constantly bullied. At one point he followed his brothers to Winchester College, where the bullying continued. At the age of 12, he though about suicide. Instead he retreated into a daydreams and constructing imaginary worlds. When Trollope was twelve his mother moved to the United States with Trollope's three younger siblings. They initially lived in a commune. When that failed Trollope's mother started a bazaar. For a short time Trollope's father joined them in the United States before returning to the farm in England. In 1831, his mother returned to England. By that time, his father had gotten himself into more financial issues and the family moved to Belgium in 1834 so that Trollope's father could avoid debtors prison. Trollope's father would pass away there in 1835. Later in 1834, Trollope received a job offer back in England and returned to the country. He began working in the General Post Office. He was not happy with the work and gained a reputation for his lack of punctuality and his insubordination. When news of a position that had become available in Ireland reached Trollope, he immediately volunteered for the post, even though it was low almost everyones list for a favorable position. This change of scenery for Trollope was just what he needed. When he moved to Ireland he had decided to become a writer, although he still needed his postal job. His new boss was aware of the issues he had in London. Fortunately for Trollope, his new supervisor was willing to judge him on his merits, rather than his history. He excelled in the new environment and his travels in his job gave him time to write. It wasn't until 1844, when he married his wife, that he started writing more. Most of his stories centered in Ireland. Unfortunately that didn't play well back in England. Some of later novels he had to change the location and characters of some of his novels. In 1868, Trollope, who had always wanted a seat in the House of Commons ran as a liberal for the seat. It was not expected that a liberal would win on votes, the corruption in Beverly, where he was running from, was notorious at the time. It was estimated that of the 1,100 voters in Beverly at the time, 300 would be willing to sell their vote. After the election, there was an investigation into the corruption of the election. Trollope would later use the experience in one of his books called Ralph the Heir. In 1871, Trollope went to Australia for a year to visit his son. He spent the year exploring Australia. This got the attention of the Australia media, who were very concerned about how Trollope would represent Australia in his writings. This was especially after Trollope's mother gave a poor review to the United States in her writings. Trollope would write positive and negative things about Australia, although at the time of his passing the Australian media was only able to focus on the negative statements that he had made. Trollope passed away in London on December 6th, 1882. Trollope was a member of Banagher Lodge No. 306 in Ireland. He was raised in 1841.